The M72 LAW (Light Anti-Tank Weapon, also referred to as the Light Anti-Armor Weapon or LAW as well as LAWS: Light Anti-Armor Weapons System) is a portable one-shot 66-mm unguided anti-tank weapon. The solid rocket propulsion unit was developed in the newly formed Rohm and Haas research laboratory at Redstone Arsenal in 1959, then the full system was designed by Paul V. Choate, Charles B. Weeks, Frank A. Spinale, et al. at the Hesse-Eastern Division of Norris Thermadore. American production of the weapon began by Hesse-Eastern in 1963, and was terminated by 1983; currently it is produced by Nammo Raufoss AS in Norway and their subsidiary Nammo Talley, Inc. in Arizona. The increased importance of tanks and other armored vehicles in World War II caused a need for portable infantry weapons to deal with them. The first to be used (with limited success) were Molotov cocktails, flamethrowers, satchel charges, jury-rigged landmines, and specially designed magnetic hollow charges. All of these had to be used within a few meters of the target, which was difficult and dangerous. The U.S. Army introduced the bazooka, the first rocket-propelled grenade launcher. Despite early problems, it was a success and was copied by other countries. However, the bazooka had its drawbacks. Large and easily damaged, it required a well-trained two-man crew. Germany developed a one-man alternative, the Panzerfaust, having single-shot launchers that were cheap and requiring no special training. As a result, they were regularly issued to Volkssturm home guard regiments. They were very efficient against tanks during the last days of World War II. However, the Panzerfaust was not a rocket launcher but instead a recoilless rifle. The M72 LAW is a combination of the two World War II weapons. The basic principle is a miniaturized bazooka, while its light weight and cheapness rival the Panzerfaust. The weapon consists of a rocket within a launcher consisting of two tubes, one inside the other. While closed, the outer assembly serves as a watertight container for the rocket and the percussion-cap firing mechanism that activates the rocket. The outer tube contains the trigger, the arming handle, front and rear sights, and the rear cover. The inner tube contains the channel assembly, which houses the firing pin assembly, including the detent lever. When extended, the inner tube telescopes outward toward the rear, guided by the channel assembly, which rides in an alignment slot in the outer tube's trigger housing assembly. This causes the detent lever to move under the trigger assembly in the outer tube, both locking the inner tube in the extended position and cocking the weapon. Once armed, the weapon is no longer watertight, even if the launcher is collapsed into its original configuration. When fired, the striker in the rear tube impacts a primer, which ignites a small amount of powder that "flashes" down a tube to the rear of the rocket and ignites the propellant in the rocket motor. The rocket motor burns completely before leaving the mouth of the launcher, producing gases around 1,400 °F (760 °C). The rocket propels the 66-mm warhead forward without significant recoil. As the warhead emerges from the launcher, six fins spring out from the base of the rocket tube, stabilizing the warhead's flight. [note 3] The early LAW warhead, developed from the M31 HEAT rifle grenade warhead, uses a simple, but extremely safe and reliable, piezoelectric fuze system. On impact with the target, the front of the nose section is crushed causing a microsecond electric current to be generated, which detonates a booster charge located in the base of the warhead, which sets off the main warhead charge. The force of the main charge forces the copper liner into a directional particle jet that, in relation to the size of the warhead, is capable of a massive amount of penetration. A unique mechanical set-back safety on the base of the detonator grounds the circuit until the missile has accelerated out of the tube. The acceleration causes the three disks in the safety mechanism to rotate 90° in succession, ungrounding the circuit; the circuit from the nose to the base of the detonator is then completed when the piezoelectric crystal is crushed on impact. The M72 LAW was issued as a prepackaged round of ammunition. 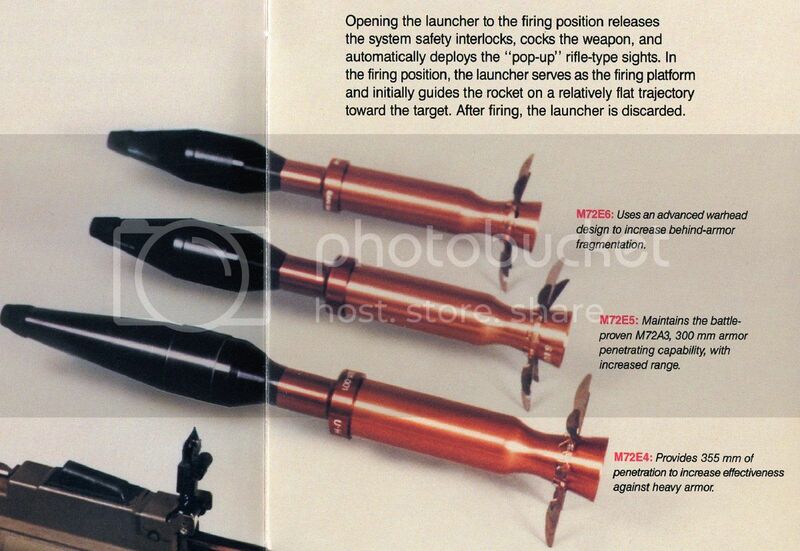 Improvements to the launcher and differences in the ammunition were differentiated by a single designation. The original M72 warhead penetrated 200mm/8 inches of armor, while the improved M72A2 model boosts this to 300mm/12 inches. A training variant of the M72 LAW, designated the M190, also exists. This weapon is reloadable and uses the 35-mm M73 training rocket. A subcaliber training device that uses a special tracer cartridge also exists for the M72. A training variant used by the Finnish armed forces fires 7.62-mm tracer rounds. The US Army tested other 66-mm rockets based on the M54 rocket motor used for the M72. The M74 TPA (Thickened Pyrophoric Agent) had an incendiary warhead filled with TEA (triethylaluminium); this was used in the M202A1 FLASH (FLame Assault SHoulder weapon) 4-tube launcher. The XM96 RCR (Riot Control Rocket) had a CS gas-filled warhead for crowd control and was used with the XM191 quadruple-tube launcher. Once fired in combat, the launcher is required to be destroyed to prevent its use by the enemy as a booby-trap; the enemy could collapse the launcher to its original configuration, fill it with explosives, and rig it to explode if moved by a soldier believing it to be unused. Due to the single-use nature of the weapon, it was issued as what is called a "wooden round" of ammunition by the Canadian Army and the United States Army, requiring no checks or maintenance, just as small-arms ammunition can be stored in the same manner for years without any problems. The M72 rocket has been in Australian service since the Vietnam War. Currently, the Australian Defence Force uses the M72A6 variant, known as the Light Direct Fire Support Weapon, as an anti-structure and secondary anti-armor weapon. The weapon is used by ordinary troops at the section (squad) level and complements the heavier 84-mm Carl Gustav recoilless rifle and Javelin missile, which are generally utilized by specialized fire support and anti-armor troops. Taiwan (The Republic of China Army) uses the M72 as a secondary anti-armor weapon. It is used primarily as a backup to the Javelin and M136 (AT4) anti-tank weapons. The weapon is later reverse-engineered into the "Type 1 66mm Anti-tank Rocket" but is more-popularly nicknamed as the "Type 66 rocket" due to its caliber. The M72 LAW is used in the Finnish Army (some 70,000 pieces), where it is known under the designations 66 KES 75 (M72A2, no longer in service) and 66 KES 88 (M72A5). 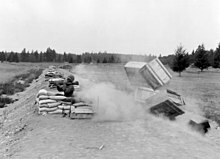 In accordance with the weapon's known limitations, a pair of "tank-buster" troops crawl to a firing position some 50 to 150 meters away from the target, bringing with them four to six LAWs, which are then used in rapid succession until the target is destroyed or incapacitated. Due to its low penetration capability, it is used mostly against light armored targets. The M72 is the most common anti-tank weapon in the Finnish Army. Finland has recently upgraded its stocks to the M72 EC LAW Mk.I version. It is designated 66 KES 12. Claimed penetration for the M72 EC LAW is 450mm of rolled homogeneous armor steel plate, nearly twice that of the M72A2. It also fields the bunker-buster version that contains 440 g of DPX-6 thermobaric explosive, named M72 ASM RC, and locally designated 66 KES 12 RAK. The oldest version 66 KES 75 is now retired. The Turkish Army uses a locally built version by Makina ve Kimya Endustrisi Kurumu, called HAR-66 (Hafif Antitank Roketi, Light Antitank Rocket), which has the performance and characteristics of a mix of M72A2 and A3. Turkey also indigenously developed an anti-personnel warhead version of HAR-66 AP and called it "Eşek Arısı" (Wasp). The British Army had used the NAMMO M72 under the designation "Rocket 66 mm HEAT L1A1" but it was replaced by the LAW 80 during the 1980s. The M72 rocket was reintroduced into British service under the Urgent Operational Requirement program, with the M72A9 variant being designated the Light Anti-Structure Munition (LASM). M72 as used in Vietnam, 1968. Modern M72 in use in Afghanistan with U.S. Marines, 2008. Although generally thought of as a Vietnam War–era weapon that has been superseded by the more powerful AT4, the M72 LAW found a new lease on life in the operations by the U.S. Army, the U.S. Marine Corps, and Canadian Army in Iraq and Afghanistan. The lower cost and lighter weight of the LAW, combined with a scarcity of modern heavy armored targets and the need for an individual assault weapon versus an individual anti-armor weapon, made it ideal for the type of urban combat seen in Iraq and mountain warfare seen in Afghanistan. In addition, a soldier can carry two LAWs on a mission as opposed to a single AT4. The U.S. Marine Corps Systems Command at Quantico, Virginia placed a $15.5-million fixed contract order with Talley Defense for 7,750 M72A7s, with delivery to be completed in April 2011. The M72A7 LAW is an improvement on previous versions, including an improved rocket motor for a higher velocity to accurately engage targets past 200 meters, an insensitive munitions warhead to reduce the likelihood of an accidental explosion, and a Picatinny rail to mount laser pointers and night sights. The LAW is useful in Afghanistan as a small and light rocket system for use against short- and medium-range targets by foot patrols in the difficult terrain and high elevations of the country. The U.S. military is still purchasing LAW rockets as of January 2015. Several M72A1 and M72A2 LAWs captured from Vietnam War have been put into service with the Chemical Force of the Vietnam People's Army. The launchers are upgraded to be able to fire multiple times and are armed with M74 incendiary rounds. Exposed M72A6 rockets (lower right) alongside M72A6 tubes and ammunition for 84 mm Carl Gustav recoilless rifles; awaiting destruction. Extended: less than 1 m (39 in). Closed: 0.67 m (26 in). Complete M72A2: 2.3 kg (5.1 lb). Complete M72A3: 2.5 kg (5.5 lb). Front sight: reticle graduated in 25-m range increments. Beyond these ranges there is less than a 50% chance of hitting the target. Italy : M72A5 variant since 2007. Mexico: First seen in September 2018. United Kingdom: Used by the British Army from the 1970s to the early 1990s. The M72A9 variant was reintroduced into service for the Afghanistan War. ^ The U.S. Army partially replaced the Super Bazooka not only with the M72 LAW, but also M67 recoilless rifle, and U.S. Marines kept the Super Bazooka in service till the late 1960s. ^ SARPAC was never adopted by the French Army; export only. ^ Various reports in 1983 stated that during the Congressionally mandated tests the first M72E5 tested had an accuracy problem, because its larger-diameter rocket motor interfered with the deployment of all the stabilizing fins after leaving the launcher. The manufacturers have since made modifications that have solved that problem. ^ Rottman, Gordon L. (15 March 2011). The Rocket Propelled Grenade. Bloomsbury Publishing. ISBN 9781849081542. Retrieved 14 March 2018 – via Google Books. ^ Katz, Sam; Russell, Lee E (25 Jul 1985). Armies in Lebanon 1982–84. Men-at-Arms 165. Osprey Publishing. p. 8. ISBN 9780850456028. ^ "The Coconut Revolution (2001, 50min) (480x360)". youtube.com. Retrieved 14 March 2018. ^ "M72 products" Archived 2015-03-21 at the Wayback Machine. Nammo Talley, Inc. Retrieved September 25, 2014. ^ Mary T. Cagle "History of the TOW Missile System", page 10, U.S. Army, 1977. Redstone Arsenal PDF file of official TOW history that discussed the new family of antitank weapons: the M72 LAW, the Dragon and the TOW. ^ "FM 7-7" (PDF). www.bits.de. March 1985. Retrieved 10 November 2018. ^ "LIGHT ANTIARMOR WEAPONS" (PDF). DEPARTMENT OF THE ARMY. 30 August 2001. Retrieved 10 November 2018. ^ "Space and Electronic Warfare Lexicon". Archived from the original on March 15, 2010. Retrieved 30 October 2010. ^ REL22751 – M72 (L1A2F1) Rocket Launcher Archived 2012-05-20 at the Wayback Machine – Australian War Memorial. Accessed December 2010. 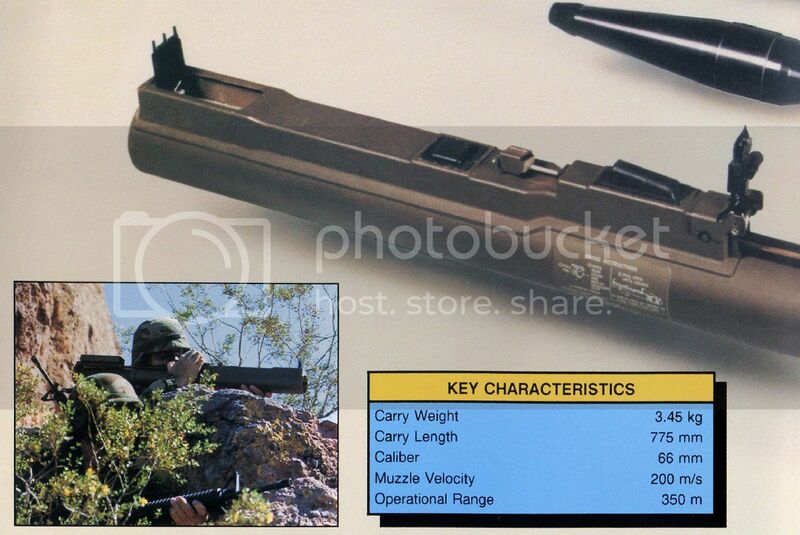 ^ Weapons Used by Infantry Rifle Sections – diggerhistory.info. Accessed December 2010. ^ "Air Force technology: Equipment – Defence Jobs Australia". Defencejobs.gov.au. Archived from the original on November 29, 2012. Retrieved 2013-01-01. ^ "Nammo Ammunition Handbook: Edition 2", Nordic Ammunition Company (Nammo), page 131, 2014. ^ "MKEK Makina ve Kimya Endüstrisi Kurumu / Mechanical and Chemical Industry Corporation". Mkek.gov.tr. Archived from the original on March 14, 2012. Retrieved 2013-01-01. ^ "LASM – British Army Website". Army.mod.uk. Archived from the original on November 23, 2012. Retrieved 2013-01-01. ^ "Oh, the Horror, the Horror". Archived from the original on 2008-03-26. Retrieved 2008-03-26. ^ "M72 Light Anti-tank (sic) Weapon System (LAW)". Gary's U.S. Infantry Weapons Reference Guide. ^ "Marines Fought the LAW, and the LAW Won". Defenseindustrydaily.com. 2005-03-10. Retrieved 2013-01-01. ^ Antal, John (2010). "Packing a Punch: America's Man-Portable Antitank Weapons". Military Technology. 3/2010: 88. ISSN 0722-3226. ^ "Light Assault Weapon (LAW)". FBO.gov. ^ US Army publication, September 30, 1977 "FM-7 The Mechanized Infantry Platoon/Squad Section B-21"
^ a b c d e f g h i j k l m n o p q r s Jones, Richard D. Jane's Infantry Weapons 2009/2010. Jane's Information Group; 35 edition (January 27, 2009). ISBN 978-0-7106-2869-5. ^ "El Salvador". Military Technology World Defence Almanac: 60. 2005. ISSN 0722-3226. ^ "Israel: LAW on Order". Retrieved 29 August 2017. ^ "Γενικό Επιτελείο Στρατού". Retrieved 29 August 2017. ^ Vining, Miles (June 19, 2018). "ISOF Arms & Equipment Part 4 – Grenade Launchers & Anti-Armour Weapons". armamentresearch.com. ^ de Cherisey, Erwan (24 September 2018). "Mexican military shows off new equipment". IHS Jane's 360. Paris. Archived from the original on 24 September 2018. Retrieved 25 September 2018. ^ "Insight - Syria rebels get light arms, heavy weapons elusive". Reuters. 2012-07-13. Retrieved 29 August 2017. ^ Owen, William F. (2007). "Light Anti-Armour Weapons: Anti-Everything?" (PDF). Asian Military Review. Archived from the original (PDF) on July 7, 2011. Retrieved 2010-05-12. ^ "Same Difference – The 66 is Back". 2009-03-30. ^ "Home Guard weapons through time". histsamling.dk. p. Danish. Retrieved 22 February 2016. ^ Holmberg, Hans. III Panserinfanteribataljon/Jydske Dragonregiment i 1985. pp. 6, 11, 14, 16, 19, 21. Retrieved 22 February 2016. ^ "David Thompkins Interview". GWU. 14 February 1999. Retrieved 17 October 2011. ^ "Army of the Republic of Vietnam 1955–75". United States. Retrieved 29 August 2017. 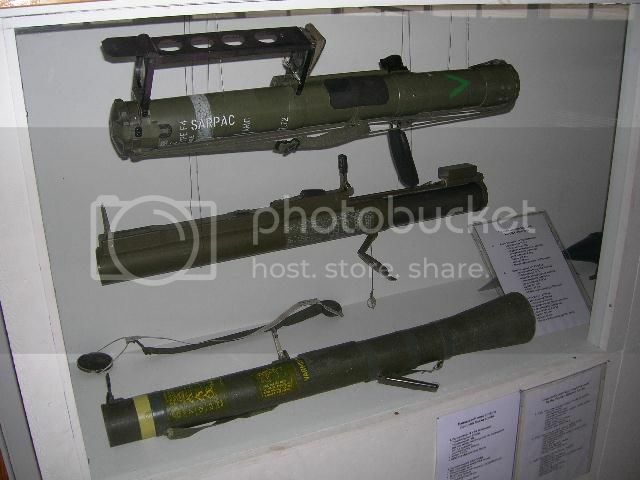 Wikimedia Commons has media related to M72 LAW. Patent for sights of M72 patented by Paul V. Choate of Milton, MA. Patented by Paul V. Choate of Milton, MA.